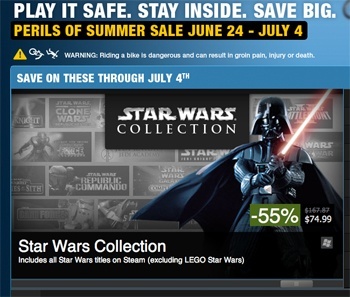 Valve wants you to know that summer is a dangerous time of the year. But you know what's not dangerous? Buying games at reduced prices. Steam's seasonal sales lists always read like love letters to consumers. Steam has just announced its "Perils of Summer" sale and the message reads a little like something Dave Barry would write: "Play it safe. Stay inside. Save big." Valve's message isn't complicated, and it's pretty funny when you stop and think about it. If the Discovery Channel has taught us anything, it's that the world can be a pretty scary place. It's particularly unpleasant during the summer, when our parents tried to make us run around outside in heinously hot weather. It's just better for everyone if we pick up some good games for cheap prices and stay inside where it's safe. The sale is going from now until July 4th; below is the list of today's special deals and their new prices. Titles discounted for the sale are reduced 33-66% from their usual list price. Some of the bigger announced specials include (but aren't limited to) 75% off the 2K Complete Pack, 75% off Call of Duty Collection, 50% off THQ Complete Pack, 25% off Square Enix + Eidos Collection, 66% off all Atari games, 33% off all Ubisoft games, 66% off all Codemasters games, 33% off Valve Complete Pack, 25% off Rockstar Complete Pack, and 55% off Star Wars Collection.